Our ethos at tensARC has been to develop innovative, architecturally efficient, and commercially viable structures that are known throughout the commercial industry for their superior design quality. In order to meet this goal we provide a creative environment where commercially viable innovation is promoted and developed throughout the work force. 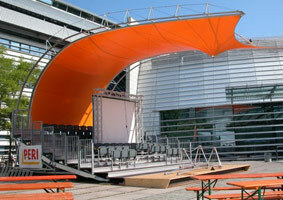 To promote the benefits of lightweight structural design by providing efficient use of space and structure. To develop innovative solutions with a widespread recognition for quality. To generate substantial cost savings through effective design. To give recognition and reward for all contributions. In 2000 a TCS programme brought together a small group of experts from a wide range of backgrounds; the purpose of which was to develop a radically new temporary grandstand canopy roof. 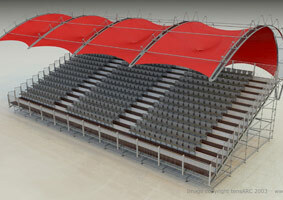 Arena Seating (the UK’s leading temporary event company) in conjunction with Dundee University’s lightweight structures group developed advanced software analysis, materials and engineering to create ARIES; possibly the most advanced temporary deployable roof in the world. ARIES was ahead of its time and a huge success in every aspect. Unfortunately, due to the limited number of venues that could support this revolutionary concept the product was not released commercially. However, due to the concept of ARIES, in 2002 two of the leading team members formed tensARC Ltd to co-opt the technologies and knowledge generated from the ARIES project to create commercially viable solutions for deployable structures and tensile fabric canopies. 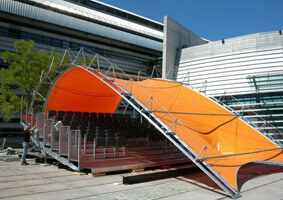 Since that day we at tensARC have specialised in the design of lightweight deployable structures and tensile fabrics. This has allowed us to become experts in fields such as tensile fabric structures, deployable grandstands, deployable grandstand roofs, fabric development and internal shade sails. Contact us to discuss your project, get advice on your requirements and to discover how we can help.